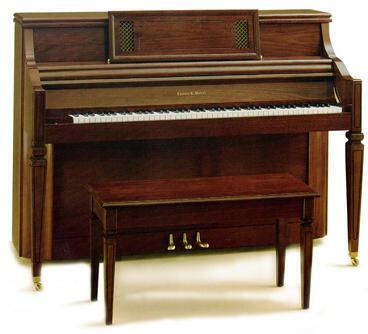 The Charles R. Walter furniture console pianos are actually compared with other studio pianos. Because they have studio sized actions, long keys and very long strings. 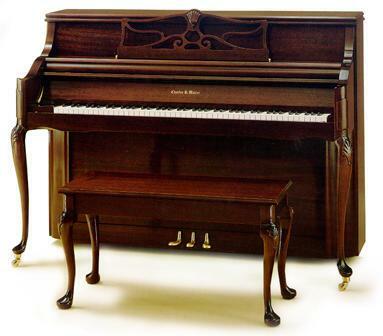 The piano in the inside is the same as the studio only smaller because of cabinet designs and smaller casters. 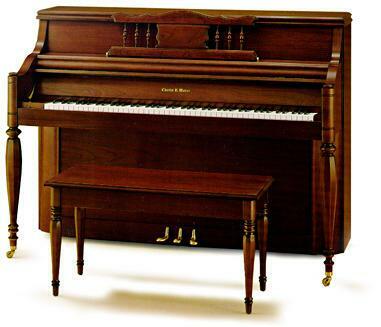 The piano is even rated as a studio piano in the Piano Book. Thus allowing you to have a beautiful furniture case without any sacrafice of quality. Versatile is the word for this lovely model which fits perfectly into any decor. 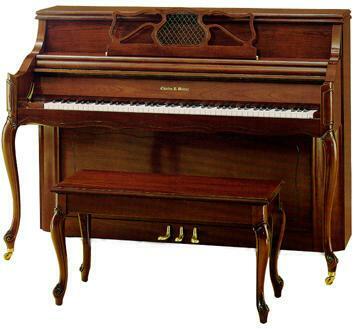 Fluted legs and "harp design" music desk further enhance its beauty. Available in Walnut, Cherry, Oak, and Mahogany. Shown here in high sheen Walnut. The elegance and grace of 18th Century France are captured in this magnificent model. The music desk, true to the styling of the period, features a custom antique brass inset. Shown here in Cherry. The Queen Anne styling features the graceful curved lines of the cabriole leg enhanced by beautiful shell carvings on both the legs and music desk. This enduring style is shown in ribbon-striped Mahogany and is also available in Oak, Cherry, and Natural Cherry. 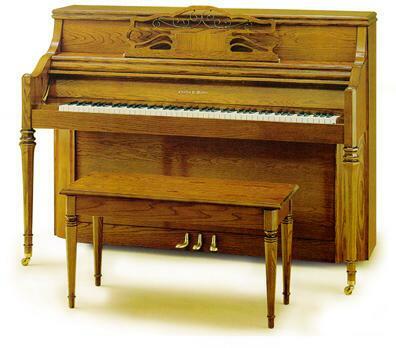 Smooth octagonal legs and beautifully-carved music desk contribute to the charm of this American Colonial Design. Shown in satin (low sheen) Cherry. Also available in Oak, high sheen Cherry, and Light Cherry. Graceful swirls of antique brass embellish the handsome music desk of this model which faithfully reflects the Spanish influence in furniture design. Available in Oak. We have listed some of the Walter 1520 unique features, but the pleasing tone, the playability, the excellent tuning stability and the ease of tuning, are also outstanding features and are impossible to photograph. 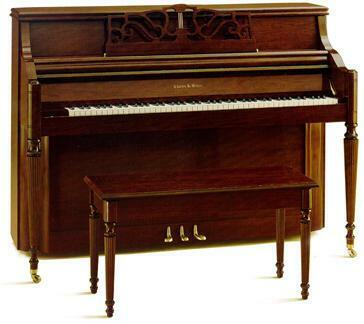 All Walter pianos have a 12 YEAR FULL WARRANTY against defects in parts, material and workmanship. Height floor to keybed, 23 3/4"
Lustrous cabinet finishes numerous coats of stain, wood filler and lacquer, painstakingly rubbed by hand, produce the deep luster of Walter cabinets... comparable to the finish of the finest furniture. Cabinet dimensions Height 43 3/8," depth 25." Add 3/4" to depth and 1 1/4" to width for French Provincial and Queen Anne.